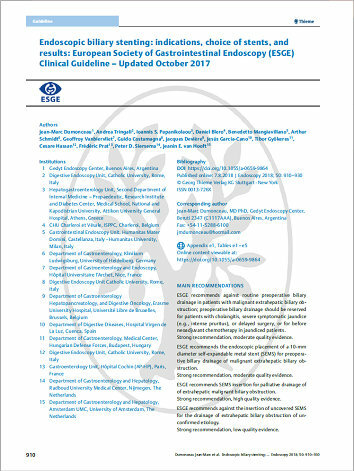 ESGE recommends against routine preoperative biliary drainage in patients with malignant extrahepatic biliary obstruction; preoperative biliary drainage should be reserved for patients with cholangitis, severe symptomatic jaundice (e. g., intense pruritus), or delayed surgery, or for before neoadjuvant chemotherapy in jaundiced patients. ESGE recommends the endoscopic placement of a 10-mm diameter self-expandable metal stent (SEMS) for preoperative biliary drainage of malignant extrahepatic biliary obstruction. ESGE recommends SEMS insertion for palliative drainage of of extrahepatic malignant biliary obstruction. ESGE recommends against the insertion of uncovered SEMS for the drainage of extrahepatic biliary obstruction of unconfirmed etiology. ESGE suggests against routine preoperative biliary drainage in patients with malignant hilar obstruction. ESGE recommends uncovered SEMSs for palliative drainage of malignant hilar obstruction. ESGE recommends temporary insertion of multiple plastic stents or of a fully covered SEMS for treatment of benign biliary strictures. ESGE recommends endoscopic placement of plastic stent(s) to treat bile duct leaks that are not due to transection of the common bile duct or common hepatic duct.